Pets Costs > Cat Breeds > How Much Do Abyssinian Cats Cost? How Much Do Abyssinian Cats Cost? The Abyssinian cat, referred to as an Aby by many cat lovers, is known for its “ticked” coat, which is an unusual pattern that we are not used to seeing on a cat. Introduced in 1858 in Ethiopia, the Abyssinian was originally brought home with British soldiers shortly after they were deployed in Africa. 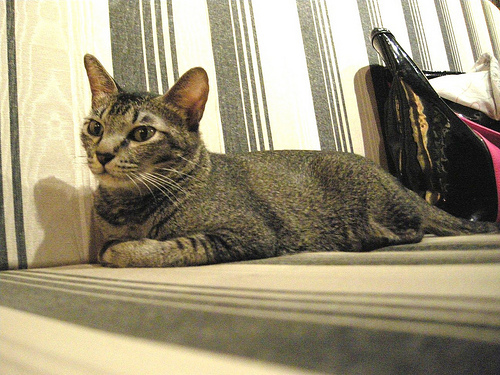 The shape of the face and ears are the trademarks of the Abyssinian breed, and many people say that the body resembles the Sphinx. With most breeders, an Abyssinian cat will depend on the breeder, age, color, quality and geographical location. If you are looking for an “average” Aby kitten, the costs can range from $300 to $550; however, if you want a show-quality Abyssinian cat, the costs can be as high as $1,000 to $1,500. Usually, the rarer the color, the more the cat is going to cost. For instance, Aksum Abyssinians, a breeder we found online, offered rare TICA approved colors for $1,500 each. Blueriver Abys, another breeder, also offered show-quality breeds ranging anywhere from $1,000 to as much as $1,500. Most reputable breeders, when you adopt, should include up-to-date vaccinations, any medical records, paperwork (CFA and/or TICA) indicating whether it is a purebred, and a travel crate if it is going to be shipped via air. Most kittens will be available for adoption at 12 to 16 weeks. If the cat has to be shipped, additional shipping fees may apply. Be prepared to spend upwards of $200 to $350 to have a cat shipped via air or ground. Of course, a cat will need vaccinations, vet checkups, toys, food and litter in the future. Plan on budgeting at least $40 to $60 per month to take care of your cat. Many cats will also require a cat bed, a scratching post, and perhaps a climbing post if you never owned a cat before. While optional, consider purchasing pet insurance, which will either be a monthly or yearly fee. This will cover medical expenses if your cat were to become ill or injured. Breeders will often ask for a deposit in order to hold a kitten. This deposit, just like any other deposit, will be applied to your adoption once you follow through. An Abyssinian has a close-lying, soft coat that comes in a variety of colors. While some coat colors are common, there are some that are extremely rare. Using that breeder link noted above, they note that they have some coat colors that are known to be in less than 75 cats in the world. Most coats will have a band of three to four colors that are dispersed across their coat. Today, championship colors include tawny, cinnamon, blue, fawn and silver, with cinnamon being the most popular option. Other recognized coat colors are lilac, red, chocolate and tortoiseshell and rarer options can include black and ruddy. The Abyssinian body will have long, slender legs with a wedge-shaped head, and their eyes are large and wide with a tuft of hair at the tips. Common eye colors are green or hazel. They are known to be affectionate, but at the same time, they demand a lot of attention. Compared to most cat breeds, they tend to become very attached and tend to be less noisy. It is also claimed that they are the most intelligent cat breed available. The average lifespan of an Abyssinian cat is 12 to 15 years. Due to the popularity of this breed, the waiting lists may be long. If you want to adopt one, make sure that you get on a waiting list as soon as possible. This breed is ideal for owners who want a loving and affectionate cat that is filled with energy. This breed is generally suited for families and those with active lifestyles. Always make sure that the breeder includes some sort of health guarantee to protect your investment. Most reputable breeders may ask you to fill out a questionnaire before allowing you to adopt one and may even want to investigate your living situation. Older cats typically cost up to 50 percent less than a kitten. Consider checking with your local shelters to see if they have any, or if possible, add your name to a waiting list so that they can call you when one does arrive. Even if you can’t find this particular breed, you may be able to find one that closely resembles it. If you are just looking for a pet do not plan to place your cat in any type of show, then be satisfied with the cheaper non-champion breeds.